I’ve uploaded countless pictures of the outside of the van but what’s inside The Yellow Sound Machine? Is it a Tardis-like expanse with synthesizers covering the walls or is it a mattress and a Casio keyboard? In this post I’ll give you a quick tour and show you what I think sets it apart from the average camper van. I won’t cover every aspect in great detail here otherwise this would be a veeeeery long post but I’ll highlight what I think are the most interesting areas and explain how they work together. To help keep it short I won’t list all the components I’ve used, I’ll list these in another post. This photo shows most of the living area. All of my equipment, clothes and belongings are squeezed into this 3 x 2m space. The kitchen area is constructed mostly of old pallet wood. I chose a really compact hob and sink to save space. I used a special wood oil on the worktop to add some variation. I love this finish, it completely transforms the wood. The shower is basically a sealed PVC wet room with an extractor fan, which sounds simple, but this was probably one of the hardest things to build. I’m so glad to have it though, it makes life on the road a little bit more comfortable and sometimes nothing beats a warm shower! The toilet is portable so I can move it out when I need to empty it or shower. Building the studio was where things got really interesting for me. The PC has a high efficiency power supply and both this and the monitors run on 12V. This means there is no efficiency loss from the inverter. It was challenging but I’ve managed to create a very capable studio setup which consumes less power than the equivalent laptop. The studio is split into two sections. The computer and audio interface in a shock-proof box mounted on the wheel arch and the PC monitors and peripherals which fold out of a compartment on the side of the shower room. I really like this setup, it means that if I park in the right orientation and open the back door I can have the sun shining into the back of the van and can work on the computer whilst feeling like I’m outside. It’s a great feeling! 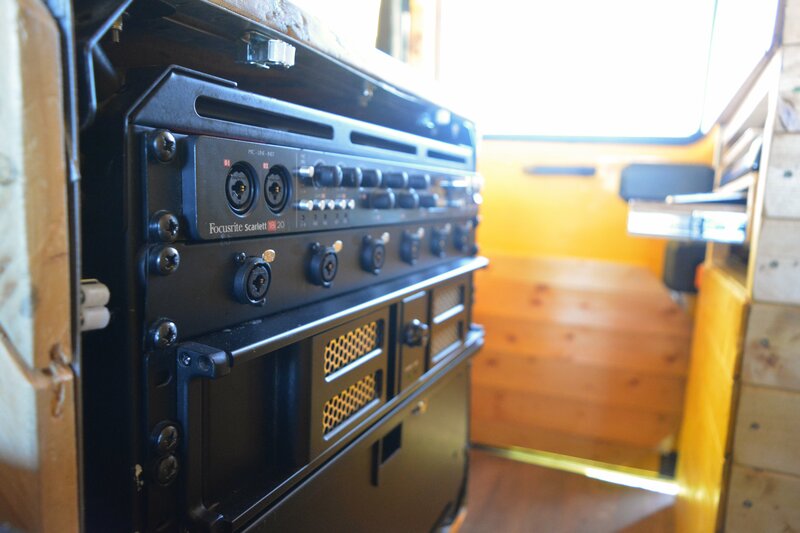 The inner rack is a shock-proof 19″ rackmount system. It took me ages to find something that was suitable for what I wanted to build but this was perfect. It has a rubber brush on each corner which suspends the rack within the outside box. I built the outer box from steel strip and pallet wood, it is taking quite a lot of weight and needed to withstand bumpy roads so I made sure it was really solid. The box is mounted on two sliding rails which means it can slide out of the way when I need to make the bed at night. Although the monitors were an integral part of the studio, I didn’t want to see them every day and wanted to be able to hide them when I was not using them. As a solution I created a folding enclosure which not only conceals them but keeps them safe while I’m driving. I wanted to make the enclosure as invisible as possible and without any obvious way to open it, similar to one of those Japanese puzzle boxes. To open the enclosure a section of the cladding must first be slid away revealing the keyboards on a sliding drawer. This allows the main part of the enclosure to swing open. Having worked on two monitors for years, I didn’t feel like going back to one now. It was really important for me to keep the studio as close to what I was used to with as few compromises as possible. No studio would be complete without monitor speakers. Mine are mounted either side of the kitchen area. They’re pretty heavy so I reinforced the area with strips of steel bar and they’re held in place with some meaty bolts! The bed makes up the seating area in the day and, with a few adjustments, transforms into a decent sized bed when I want to sleep. It was important to me to have a full length bed in the van. The only problem was that the van was the short wheel base version and I wanted to fit a studio inside. As such, space was a bit limited. I struggled for a few weeks with how to solve this and eventually decided to have the studio rack mounted on a sliding mechanism so it can move and make space for the end of the bed. The end is made from the seat for the studio and an end piece fixed to the wall which folds down onto the stool. The main part of the bed then pulls out and the cushions are rearranged to form a mattress. Most of the components for the electrical system are hidden underneath the part of the bed closest to the cab. The top lifts to allow access. The main storage area is underneath the bed. As with the electrical area at the top of the bed, the lid lifts to give access to the underneath. There’s quite a lot of space under here. I keep two plastic storage boxes, one with food and one with audio and computer bits. I keep mostly cooking things like pots and pans and plates and mugs underneath the sink. Ingredients and food that I use regularly goes in this cupboard above the fridge. I closed off the space above the cab to give more storage space. To the left I keep my clothes, the middle has a box with chargers and electrical bits that I use frequently and the right is mostly books and also the display for the charge controller. I got this roof rack custom made to fit the van. It’s absolutely solid and you can easily stand up here with a few people. I have two 200W solar panels mounted at the front and I use the rear part for further storage (or sitting and having a beer). So that’s where I’ve been living for the past three months. Someone said to me once that a van is never finished and now I know exactly what he was talking about. I’ve already got loads of ideas for improvements and I’m sure it’s going to evolve over the next few years as I get a better idea of what I need but for now it’s working well!